It’s September, the weather is starting to get cooler in some parts of the country. It’s football season! It’s the perfect time for some chili! 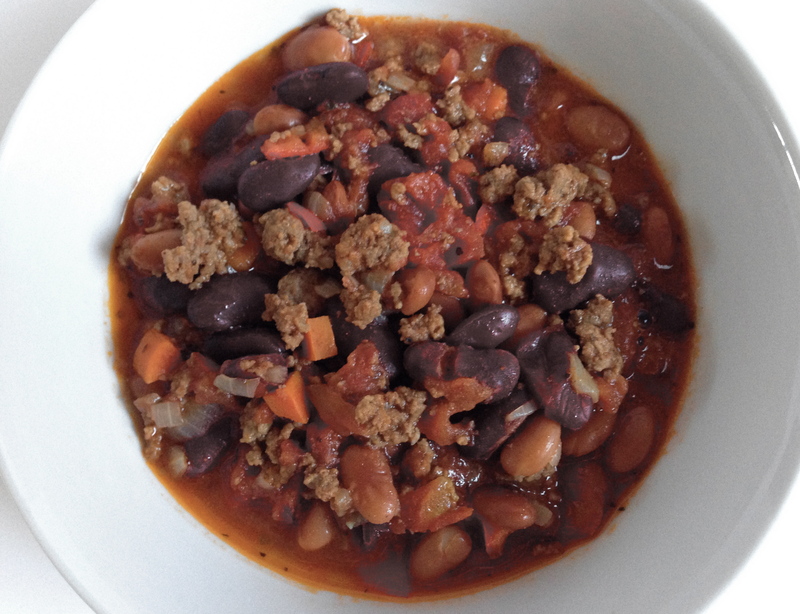 I got my inspiration from Ellie Krieger’s “Three Bean and Beef Chili.” I changed the recipe a bit and used almost all organic ingredients. Heat the oil in a Dutch oven over moderate heat. Add the onion, bell pepper, and carrots and cook for approximately 10 minutes, stirring occasionally. Add the cumin and cook for about 1 minute. Add the ground beef. With a spoon break up the meat and cook until it is no longer pink. Stir in the tomatoes, water, chipotle, adobo sauce, oregano, salt and pepper. Simmer and stir from time to time, partially covered, for 30 minutes. Add the beans and cook for another 20 minutes. Finally, add salt and pepper to taste. Serves 8. Editor’s note: I got most of my ingredients from Trader Joe’s, because they have the best prices. The organic ground beef was bought at Costco. I’m sorry, don’t know what to tell you. I cook mostly with fresh garlic. When making the marinade, maybe add a little at a time. Good luck! Neva mind, I’ll try the recipe exactly your way, will reduce the QTY of garlic but, as I find the flavor a bit strong.